Welcome to Grant's Point Cottage; a cozy rustic cabin located on Grant's Point. You will find this secluded location the perfect get-a-way with your own private beach access. The cottage features an open living plan from the kitchen to the dining room and living room. The living room features a large wooden stove. 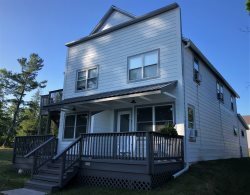 There are three bedrooms at Grant's Point Cottage; and, you will find a deck on the front of the cottage with a screen porch overlooking the back of the cottage. The beautiful sand beach is a nice walk from the cabin and faces west toward the mainland, perfect for viewing evening sunsets. Ron was so helpful pleasant to communicate with. Our week at Grants Point Cottage was idyllic and inspiring. This is our 9th year in a row visiting the Island, and of all the vacation rentals we have stayed in, this is by far our favorite. We love all the handcrafted touches in the building, from the clerestory screen porch to the wide wood plank floor to the wall constructed of old doors and the sailboat mural. There was no end of beauty and delight to be found inside and out, and we knew that if we needed anything, MIV would be there to respond and help out. Lovely site and cozy, relaxed setting. I loved all the extra information Ron gave me about the place we were staying and the island itself. First time meeting him but I felt like we were buddies! We couldn't have had a better time and after doing some research we feel like it's the best place on the island to rent. To make it better next year we plan to stay for a full week.